The ingredients synergy of Viazen Inflammation is the key of the effectiveness of this SUPERIOR FORMULA. Viazen Inflammation is a comfort solution specifically developed for people living daily with a joint inflammatory disease, including inflammatory arthritis, ankylosing spondylitis, gout, osteoarthritis or arthrosis. Several people have difficulty dealing with anti-inflammatory side effects of medical prescribed drugs, such as hepatic impairment, stomach pain, diarrhea and abdominal pain, cardiovascular disorders and bone demineralization. Viazen Inflammation is an effective natural anti-inflammatory solution without side effects. 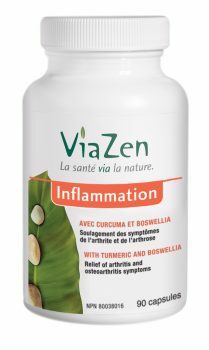 Viazen Inflammation is a powerful natural anti-inflammatory with broad spectrum of action related to 4 scientifically recognized medicinal substances. Joined together in one product, these substances inhibit effectively pro-inflammatory substances production into the body. Powerful natural anti-inflammatory action by inhibiting enzymes responsible of pro-inflammatory substances synthesis, derived from arachidonic acid. Important antioxydant property. Inflammation relief in presence of arthritis and osteoarthritis. By optimizing protein digestion, it helps to prevent immune imbalances resulting from allergens (food particles badly digested) entrance in blood circulation. Important anti-inflammatory action. This mineral is implicated in several enzymatic processes. It is also an important factor implicated in tissues healing. * Daily dosage corresponding to 3 capsules of ViaZen Inflammation. Microcrystalline cellulose, vegetable magnesium stearate, gelatine. Viazen Inflammation is free of wheat, soya, corn, yeast, peanut, gluten, egg and dairy products. It does not contain preservatives, sweeteners, colouring agents, artificial flavours and is exempt of GMO. Do not use in presence of pineapple allergy. Consult a healthcare practitioner in presence of gallstone history, biliary tract obstructions and stomach ulcers. Do not use if you are pregnant or breastfeeding. Do not use with anticoagulants, antiplatelets and antibiotics. Take note that Viazen Inflammation does not replace medical prescription of anti-inflammatory drugs. Inflammation results from the organism reaction process against an aggressive agent. This agent, responsible of the inflammation, can be of infectious origin (a bacteria or a virus), a chemical reaction (contact with toxic substances), related to an immune imbalance (allergies, cellular antigens (tissue graft), foreign antigens (autoimmune process) or resulting from a physical trauma (radiations, frictions). Inflammation appears by a group of specific clinical signs including redness, heat, swelling, pain and, depending the inflammation process extent, fever and an heart rate acceleration. Also, a general discomfort may appear. By the time, it is possible to observe a deterioration of the organ affected by the inflammation process leading to incapacitating. By example, difficulty to move in presence of joint inflammation. Acute inflammation has short duration. It disappears when the aggressive agent is rapidly controlled or eliminated, allowing the healing of affected tissues. Inflammation will become chronic when the aggressive agent is present during a very long period. It will still be going on as long as the aggressive agent is not removed and remains present. Initially the affected part of the body reacts in contact with the aggressive agent. The inflammatory reaction includes complex physiological and metabolic events, modulated and orchestrated by inflammation mediators (histamine, prostaglandins, cytokines, etc.). These mediators come from cells or plasma. Redness and heat are caused by blood vessels dilatation and by the increased blood flow in the affected area. The release of a liquid (inflammatory exudate) in the intercellular space will generate tumefaction (swelling). The pain which appears, results from the compression of nerve terminations by the tumefaction and by the action of chemical factors released in the affected area. Lastly, a general discomfort, associated to tiredness and light depression, appears according to the important energy request during the inflammatory process. The term arthritis is the generic term regrouping more than one hundred of acute and chronic joint inflammatory affections. Majority of arthritis affections are chronic, which means that their development occurs on several months or years, and makes life invalidating. Specific touched joints, pain and ankylosis levels vary from an individual to another and according to the type of the joint disease. The inflammation may be present at the level of one, several or the whole structures which compose the joint (the joint capsule, the synovial membrane, the cartilage, ligaments and tendons). The skin can be red and warm. Symptoms intensity will vary according to the type of the disease. They can also vary from one person to another. Certain people will have remission period, during which symptoms attenuate, or can even disappear completely. In long term, the overproduction of inflammation will have bad consequences on joint health, since it will generate a loss of joint mobility. 1. Gagnon R. La Nutrithérapie. Collection Douce Alternative, Amyris. 2004. 287 pages. 2. Marieb E. Anatomie et physiologie humaines. ERPI.1993. 1013 pages. 3. MacKay D. Miller AL. Altern Med Rev. 2003. Nov;8(4):359-77.